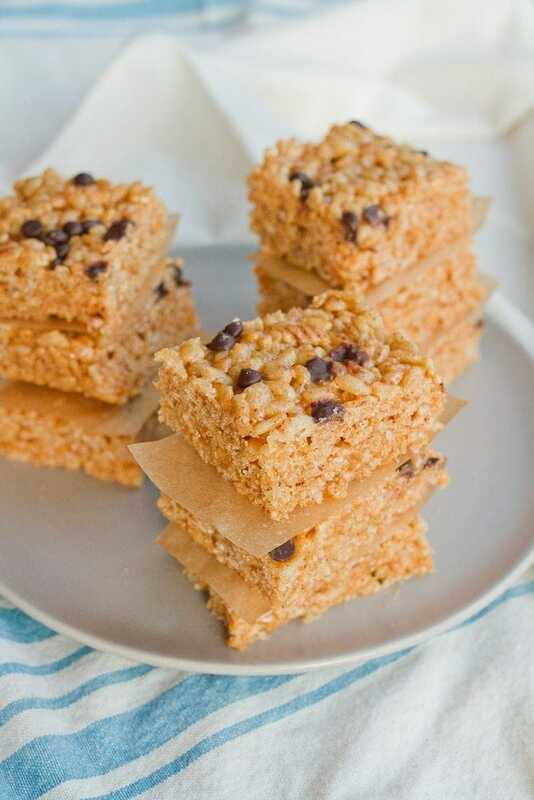 Healthy brown rice crispy treats made with brown rice crisp cereal, brown rice syrup, almond butter and coconut oil. They’re vegan and gluten-free. Howdy from sunny Colorado! I’ve been in Denver since Friday for a training and today I’m in Boulder hanging out with a friend I haven’t seen in ages. I’m probably speaking too soon, but the weather has been BEAUTIFUL so far. It’s actually warmer here than it has been in Richmond lately! I love it. So, it’s Sunday funday and I have a little treat to share with you — gluten-free and vegan brown rice crispy treats! I made these for my bestie, Alyssa. She loves rice crispy treats. It was her birthday last week. Obviously celebratory treats were in order. I was going to make regular (marshmallow based) rice crispy treats with sprinkles, but decided against it at the last minute since I knew Alyssa wouldn’t mind me healthifying (not a word, I know, but let’s roll with it) the recipe a bit. 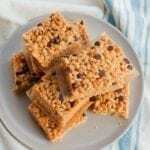 I’ve made brown rice crispy treats before however this recipe is a little different. Oh, and I added a few dairy-free chocolate chips just for fun! If you want to have a lower amount of sugar you can forego the chocolate chips. If you’re unfamiliar with brown rice crisp cereal, it’s a gluten-free crispy cereal made with whole grain brown rice. You can find it in the cereal aisle at any health food store like Whole Foods. I usually use the Erewhon brand. As for the brown rice syrup, it’s a natural sweetener that has a relatively low glycemic index. You can find brown rice syrup at your local health food store too. It will be with all the other natural sweeteners like maple syrup and honey. Measure brown rice crisp cereal and place in a large bowl. Place brown rice syrup, almond butter and coconut oil in a saucepan over medium heat. Heat while stirring until mixture is combined and creamy, about 5 minutes. Remove from heat and add the vanilla and sea salt. Pour brown rice syrup mixture over the rice cereal and stir until well combined. 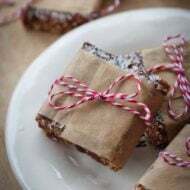 Press cereal into a square baking dish lined with parchment paper with your hands. Press chocolate chips into the top. Let cool in the fridge for 1 hour before cutting into squares. These look great, Brittany! 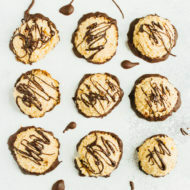 I usually use maple syrup in my baking too, but I love the idea of the brown rice syrup. Thanks for sharing and happy belated birthday to Alyssa! I HAVE to make these. 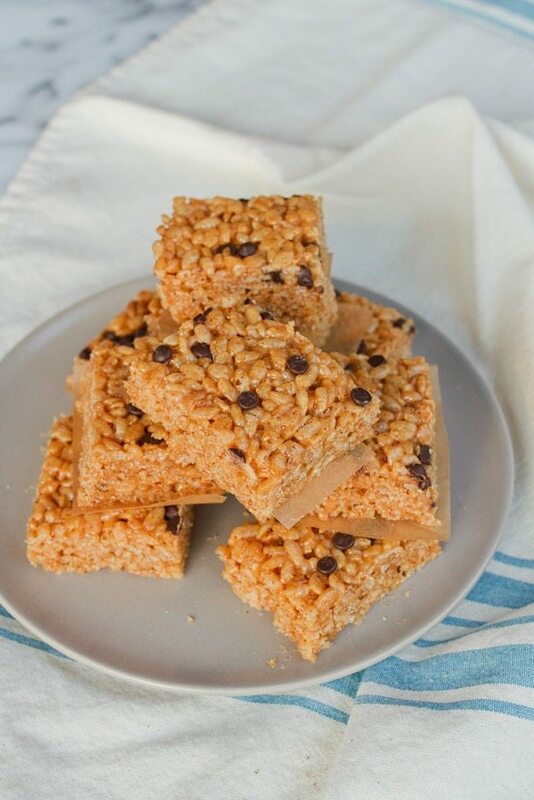 My husband is a rice krispy treat fiend, but I never make them because they’re so unhealthy. He’s going to be so happy! I love that you used “healthifying” because it’s the best “word” ever! Ha! 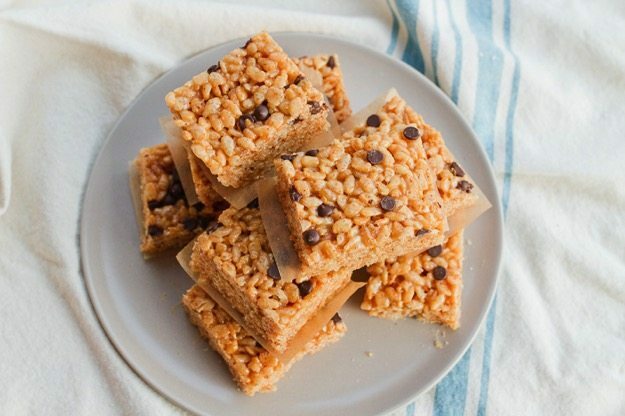 Who doesn’t love a rice crispy treat?! And especially when they’re all good for me! 🙂 Pinned! Droooooling! Would love to try making these!! Sure this is yummy, but doesn’t this has too much carbohydrates in it? It is so nice to see rice crispy treats without marshmallows in them. Thanks for sharing! AND THEY WERE SO GOOD. Best birthday ever! For some reason, those look so good right now! It’s exactly what I have been craving, I just couldnt figure it out! Oh man, these are so good! 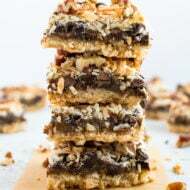 I have made something similar and used CHOCOLATE rice crisp cereal! Just want to mention that it’s SUPER helpful when you list nutrition information (including carbs, protein, and fat) for recipes like you did here! Hi Jessie! Thank you for the feedback. I’ve been adding nutritional info for all my recipes for past year or so. Some of the old recipes don’t have nutritional info, but I’m working on adding it for all my recipes because I know it’s helpful! 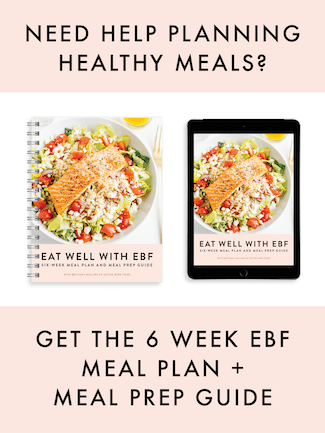 If you ever come across a recipe here on EBF that doesn’t have the nutritional info, just ask and I’ll calculate it for you!! Have a lovely weekend!